Home » Repository vs. Depository – What’s the Difference? By some accounts, English has as many as 227,000-recorded words. With so many options, it should come as little surprise that some of them have fairly similar meanings. Depository and repository are two such words: they have very similar meanings to go along with nearly identical spellings. Especially for writers unfamiliar with the nuances of specific writing contexts, choosing one or the other of these nouns could be confusing. Despite their similarities, there are clear contexts when one or the other of these words is preferable. Continue reading to learn about the differences between these confusing words. What is the Difference Between Repository and Depository? 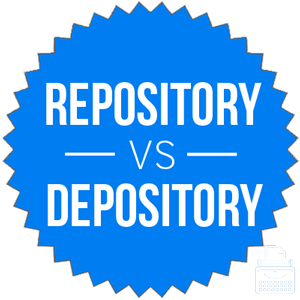 In this article, I will compare repository vs. depository. I will use each of these words in several example sentences, so that you can see how they appear in context. I will also show you a memory tool that allows you to easily choose repository or depository correctly each time, so you will always know which to choose for your own writing. What does repository mean? A repository is where things are placed for safekeeping. It is a noun. The things in question can be either concrete or abstract: a library, for example, could be thought of as a repository for both books (concrete) and knowledge (abstract). People who have grown up with the Internet understandably view Wikipedia as the foremost repository of human knowledge in the entire world. The library of Alexandria, a repository of ancient knowledge, was destroyed between 148 and 45 B.C. Repository has been part of English since the 15th century. What does depository mean? A depository is also where things are place for safekeeping. In this sense, the meanings of depository and repository overlap. In practice, however, a repository is generally a place for keeping objects or abstract things like knowledge, while a depository is a place for keeping money or other financial assets. Maria kept over 15 million dollars in a depository account in the Philipines without reporting it to the IRS. The depository box was full of one-dollar bills and five dollar bills, which made it look like it contained more money than it really did. Depository is not as old as repository; it was first recorded in the 17th century. Its root is deposit, which is related to a Latin verb that means to put away. A writer could be forgiven for confusing these related words, since their meanings have significant overlap. In actual usage, depository is reserved for financial contexts. Remember Depository vs. Repository: Since depository is related to deposit, which is a common banking term, you should have little trouble linking this word to financial contexts in your mind. Is it depository or repository? Depository and repository are both nouns that mean a place to put things. While they can be synonyms, depository is only used in contexts involving depositing money. If you are writing in a professional context involving finance, be sure to know the difference between these terms before you write. Depository is primarily used in financial contexts. Repository is used to refer to concrete or abstract things being stored. 1 What is the Difference Between Repository and Depository?